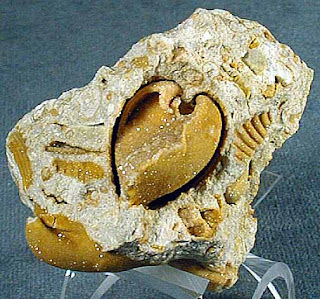 Fossil cockle (Cardium), end-on to show the heart-shape formed by the two valves of these bivalves. Photo from the Humboldt State University Natural History Museum. For me, the crux of what I do here at Catalogue of Organisms lies in the Taxon of the Week posts (I don't know if anybody else would agree with me, but it's my site, so I think I have more say in the matter). Every week I take a taxon chosen more or less at random (I have a big list of taxa on my computer at home that I move through cyclically) and find something to write on it. The idea behind this, of course, is that there is no group of organisms which is not deeply fascinating in its own way. Nevertheless, there was one group of organisms for which I knew it would be only a matter of time before they got their time in the sun, a time that would force me to make a confession that violates every standard of Catalogue of Organisms. This week's highlight taxon is the bivalve subfamily Cardiinae - and much as I hate to admit it, bivalves are almost undoubtedly the most boring organisms on the planet. So spectacularly dull are bivalves, in fact, that their monotony almost becomes their main fascination. Like turtles and linguloid brachiopods, bivalves found something they were good at early on in their history and largely stuck to it*. Representatives are known from the very earliest Cambrian that would pass unremarked if mixed in with a collection of modern taxa. The vast majority of bivalves are passive filter feeders. While some live attached to hard substrates (mussels and oysters) or free-living on the surface of the sediment (e.g. scallops), probably the most common way of life in the class is buried in the sediment with only the siphons protruded above the surface to draw in and expel water and particulate matter. The internal anatomy of such burrowing bivalves has been reduced to three major components - gonad, gills for filtering, and the muscular foot used for digging. Despite their supposed ancestry from properly encephalised ancestors, bivalves have jettisoned all traces of an actual head as unnecessary frippery**, and gone for a more decentralised nervous system. *I'll admit, there are exceptions. Oysters are somewhat odd. And one relatively small bivalve group, the anomalodesmatans, seemingly threw caution to the winds and has turned out almost all of the real freaks of the bivalve worlds, including active predators such as the cuspidariids, and the cylindrical "flower-pots" of the clavagellids. If bivalves were a distinguished well-to-do line of British nobility, anomalodesmatans would be the young ne'er-do-wells that fled the family home and joined a hippy commune. **Cavalier-Smith (1998) suggested that the headless bivalves actually represented the ancestral condition for molluscs, while encephalisation had occurred independently in the clade containing the remaining molluscs from other encephalised animals. At present, this is something of a minority view, with most authors seeing the shell-less, wormlike aplacophorans as more likely to resemble the ancestral molluscs. Acanthocardia tuberculata. Photo by Hans Hillewaert. The bivalve family Cardiidae includes two superficially quite distinct groups of animals, the burrowing cockles and the tropical reef-dwelling giant clams (though the animal that we used to collect and eat under the name of "cockle" in New Zealand, Austrovenus stutchburyi, actually belongs to a quite different family, the Veneridae). Despite the apparent difference between these two groups (and indeed, giant clams were once included in their own separate family and even superfamily), phylogenetic analysis has established that the giant clams represent a derived subgroup of the cockles nested in a cluster of more standard cockle subfamilies known as the CFTL lineage (for Clinocardiinae-Fraginae-Tridacninae-Lymnocardiinae; Schneider, 2002). Schneider & Carter (2001) and Schneider (2002) demonstrated that the subfamily Cardiinae as previously recognised was paraphyletic with regard to the CFTL clade (the two groups together forming a clade called eucardiids) and restricted the Cardiinae to a smaller monophyletic group containing the genera Cardium, Bucardium, Vepricardium, Dinocardium, Chesacardium, Planicardium, Acanthocardia and Schedocardia. Nevertheless, only three characters supported this more restricted Cardiinae clade in the analysis of Schneider (2002), two of which are actually reversed or indeterminate for subclades within the Cardiinae. Within the Cardiinae, the type genus Cardium (the name means "heart", and undoubtedly refers to the shape of the shell) might appear at first glance to be the largest, by a considerable margin, but I'm unsure how reliable this is. 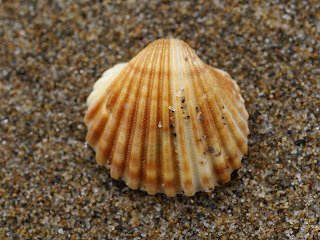 One of the side-effects of the aforementioned tendency towards monotony of bivalves in general was that in the earlier days of taxonomic study a large number of bivalve genera were placed into a rather small number of genera - names such as Nucula, Mytilus, Venus and, yes, Cardium were used to cover levels of diversity that modern authors would regard as entire families or even larger groups (to complicate matters further, many earlier bivalve workers showed an unenviable lack of imagination with regard to species names that, especially in those days before easily searchable taxonomic indices, have made bivalve taxonomy in many cases a mind-bending morass of homonymies). As a result, probably more than half of the cardiids, of almost all subfamilies, have passed through Cardium at some point in their taxonomic history, and it would not be at all surprising if a number of unrevised species that should belong elsewhere are still lurking within. For instance, a quick search online shows that one still comes along references to the common cockle of Britain as Cardium edule - this species actually belongs to the genus Cerastoderma, and is actually a member of the Lymnocardiinae, more closely related to the giant clams than to the Cardiinae (Schneider & Carter, 2001). The situation becomes even worse when fossil taxa are considered. As currently constituted, the Cardiinae date back to the late Palaeocene. The eucardiids were actually hit pretty hard by the end-Cretaceous extinction, but this was overlooked for a great many years due to the assignment to more recent genera of members of the Cretaceous eucardiid subfamily Profraginae, which lies outside the purely Caenozoic eucardiid crown group (Schneider, 2002). Evolutionarily speaking, cockles in their modern sense are actually a fairly recent group. Schneider, J. A. 2002. Phylogeny of cardiid bivalves (cockles and giant clams): Revision of the Cardiinae and the importance of fossils in explaining disjunct biogeographical distributions. Zoological Journal of the Linnean Society 136: 321-369. Schneider, J. A., & J. G. Carter. 2001. Evolution and phylogenetic significance of cardioidean shell microstructure (Bivalvia, Mollusca). Journal of Paleontology 75: 607-643. So spectacularly dull are bivalves, in fact, that their monotony almost becomes their main fascination. I have never heard such offensive molluscan hate speech espoused on this site before! Clearly you don't your mytilids from your pectinids. There are infinitely more "fascinating" characteristics of the Bivalvia than their nonexistent monotony. In fact, there is a wide array of shell types. Not to mention their physiology, culinary characteristics, byssal thread formation and ecological position as foundation species and filterers. Hmpf! Clearly you don't your mytilids from your pectinids. ...bivalves are undoubtedly the most boring organisms on the planet. Interesting post. I'd never even heard of Aplacophora before. Bivalves are awesome. Don't forget about the amazing diversity of freshwater Unionidae bivalves and thier unique life history involving glochidia transformation on fish hosts! I like this Dr. Snail guy. He knows what he's talking about. I can really identify with that. He seems like an authority on the subject. Trying to reopen the anti-mollusc wars again? What about the Teredinidae and Pholadidae or the commensal Galeommatoidea? I don't believe that is what it is at all. I does not make one bit of since, now from what I have seen on our ranch, which I might add just discovered whole arganism preservation, on dinosaure's. And from what I see you are most definently wrong about thay so call clam. I will be working with one of the university's this week, after I am finished with the. And get things authenticated. I will send you pictures of what that clam really is, and how it got there, I'll give you a hint, it does have proto in front of it's name. Don't you think its kinda funny how no body can really tell you a clear definention what it is? bivalves boring! this is a massive spectacularly diverse and beautiful group(no I am not a malacologist) - and if you only like extreme fossils or ones with silly names what about rudists? I found something that I believe to be a "calcareous heart". could someone confirm this. Here is a picture. Maje, it's definitely a bivalve of some kind. Whether or not it's specifically a cardiid I don't know enough to tell (I don't know if that distinctive shape is unique to cardiids), but it could well be. It looks like what you have there is what's called a steinkern. A buried shell has been filled up with mud which has hardened to stone. The shell itself has then been dissolved or destroyed, but the internal mold has remained intact. Because they're the mold of the inside of the shell rather than the shell itself, steinkerns generally don't preserve many more diagnostic features other than the shape of the shell, but they're certainly attractive and interesting objects.